Is your future luck written in the stars? Does great fortune await you at some point in the future? In truth, you will never know but one thing is sure, if you don’t try to win big, then you won’t. That’s why you could be one of thousands of customers trying to enjoy one of the many big cash wins available right now at the hugely popular Zodiac Casino. What’s the inspiration for Zodiac Casino? Zodiac Casino, as the name intimates, is inspired by the twelve signs of the Zodiac. These celestial constellations have been important to human society for thousands of years and almost all of us know our birth sign, whether we believe in astrology or not. If there’s one thing Zodiac Casino can predict, is that it will have some big winners and regardless of your star sign, you need to be in it, to stand a chance of winning it. What will I get when I sign up with Zodiac Casino? 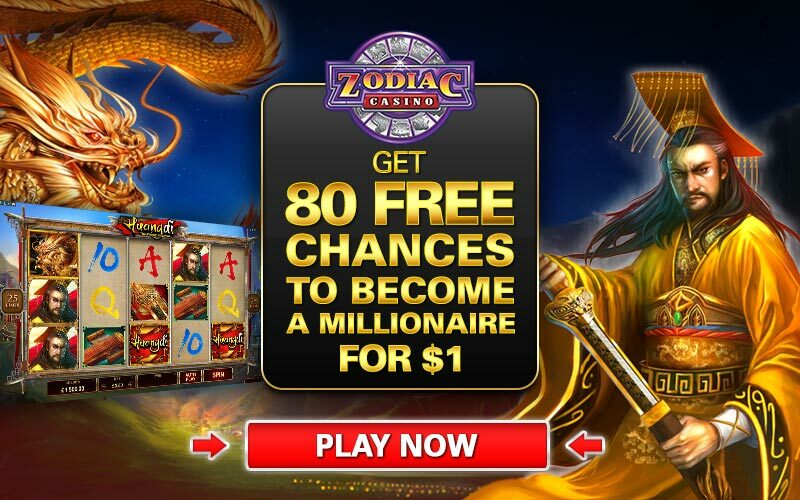 Once you have downloaded and installed the Zodiac Casino software, you only need to make a deposit of just £1 into your account and if you do, you will receive an incredible 80 spins (worth £20) on the famous Millionaire Maker slot Mega Moolah. This gives you 80 chances for just £1 to win a jackpot that is always over the $1m mark and is often considerably higher. Don’t forget, Mega Moolah holds the current world record for the highest payout ever for a progressive jackpot slot and that jackpot could climb back to that level again at any time. In addition to this great first bonus, new customers also receive additional deposit bonuses worth up to £500 on their next four deposits. You receive a 100% deposit bonus on your second deposit, with a 50% deposit bonus on your third, fourth and fifth deposit. Such a great bonus deal demands high quality games to spend your money on and fortunately at Zodiac Casino, that is precisely what you get. What games does Zodiac Casino offer? The great thing is that if you are a progressive slots fan, then Zodiac Casino offers a fabulous range of progressive games to play alongside Mega Moolah. There’s also other slots and card games offering massive progressive prizes of hundreds of thousands of dollars including Major Millions, King Cashalot, Caribbean Draw Poker and Progressive Cyberstud Poker. Alongside these progressives there is an outstanding selection of slot games to pick from. Classics such as Avalon (now available in HD), Thunderstruck and Thunderstruck II sit alongside a wealth of newer slots such as Lost Vegas, Basketball Star and Ariana. There’s also an incredible choice of both 3-reel and 5-reel games and a number of blockbuster slots including Jurassic Park, Terminator 2 and Game of Thrones. However there is more to Zodiac Casino than simply slot games. You can also play a huge choice of Video Poker games, including the popular Deuces Wild version as well as other games including Jacks or Better and even Double Joker. Add to this a fabulous choice of Blackjack games, plus the likes of Roulette, Pai Gow Poker, Sic Bo, Craps, Keno and a wide choice of other casino games and you will see why Zodiac Casino offers casino players a stellar choice of top quality games to play.